NETWORK FINALS: The 9PM episode of TRIAL & ERROR and theYOUNG SHELDON rerun lost 0.1 in final numbers. 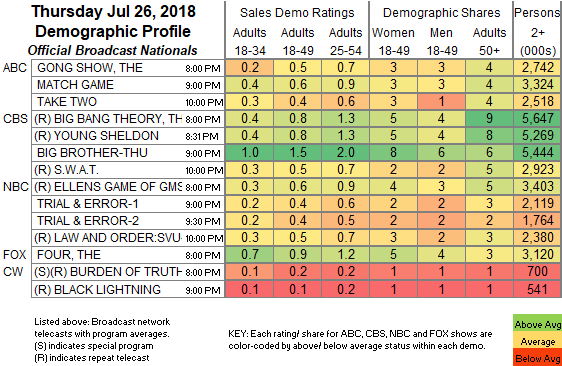 In addition, CW must have had major market baseball preemptions, because the reruns of both BURDEN OF TRUTH and BLACK LIGHTNING were down 0.1. CABLE HIGHLIGHTS: The series finale of CMT’s NASHVILLE gained 0.02 to 0.17. Discovery’s SHARK WEEK had 3 of the night’s Top 4 original shows, with TIGER SHARK INVASION and SHARKWRECKED at 0.64/0.64, and SHARKCAM STRIKES BACK at 0.53, plus SHARK AFTER DARK at 0.33. Bravo’s SOUTHERN CHARM ticked down to 0.58. On HGTV, FLIP OR FLOP ticked down to 0.43, HOUSE HUNTERS INTL climbed 0.06 to 0.33, and HOUSE HUNTERS was up 0.02 to 0.31. FX’s SNOWFALL fell 0.09 from last week’s season premiere to 0.39. 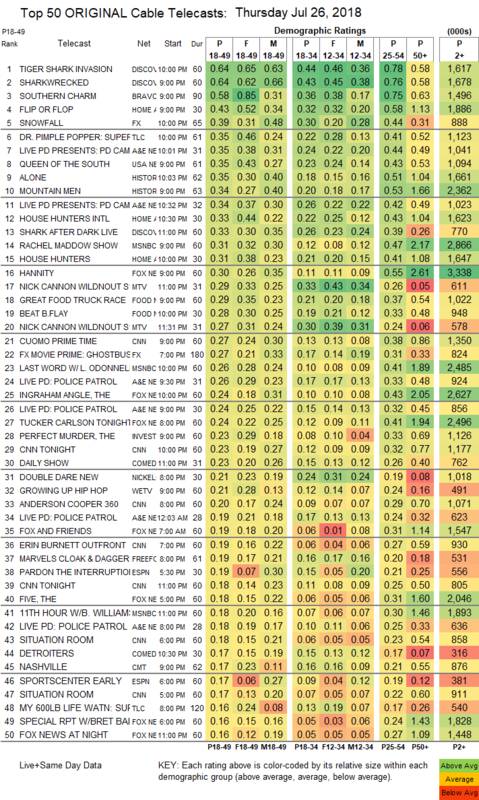 On A&E, LIVE PD was at 0.35/0.34/0.26/0.24/0.19/0.18, compared to last week’s 0.38/0.38. On USA, QUEEN OF THE SOUTH dropped 0.05 to 0.35, and SHOOTER was down 0.04 to 0.15. On History, ALONE ticked up to 0.35, and MOUNTAIN MEN held at 0.34. MSNBC’s RACHEL MADDOW SHOW led cable news at 0.31/0.47/2.9M, with Fox News’s HANNITY (with its Roseanne Barr interview) at 0.30/0.55/3.3M, and CNN’s CUOMO PRIME TIME at 0.27/0.38/1.4M. On MTV, WILD N OUT was at 0.29/0.27, compared to last week’s 0.30/0.29. On Food Network, GREAT FOOD TRUCK RACE returned at 0.29, and BEAT BOBBY FLAY was down 0.02 to 0.28. On ID, PERFECT MURDER was at 0.23. We’s GROWING UP HIP-HOP lost 0.02 to 0.21. Freeform’s CLOAK & DAGGER rose 0.04 to 0.19. Comedy Central’s DETROITERS gained 0.05 to 0.17. On Paramount, LIP SYNC BATTLE ticked down to 0.12, and AMERICAN WOMAN was down 0.04 to 0.08. POP’s IMPACT WRESTLING ticked up to 0.07.